When designing ventilation schemes for common corridors in residential developments, it is now possible to go beyond simply creating a building design that is compliant, by allowing corridors to be extended beyond the travel distances permitted in ADB. In the last article in our series about designing smoke shaft systems, we discuss dual purpose systems. Is your current project an apartment block? Do you have hot water pipes running above the corridor ceilings? If you’ve answered yes to all four questions you need a dual purpose system. In the seventh and penultimate article in our series about designing smoke shaft systems, we discuss power requirements. One of the major advantages of natural systems is the very low power requirement. Most systems use 24V ventilators and run off standard 230V single phase supplies, with standby power provided by a battery back up unit which transforms and rectifies the incoming power to charge the batteries and drive the ventilators. The batteries then provide a temporary source of power in case of loss of mains supply. This is ideal for residential buildings that may not have a 3 phase supply. In the sixth article in our series about designing smoke shaft systems, we discuss systems intended to compensate for extended travel distances. How long can my dead end be? How long is a piece of string? There is no definitive published answer to this. Approved Document B allows 7.5m in residential buildings. BS 9991 allows between 7.5m and 15m, depending upon the building and its fire precautions. In the fifth article in our series about designing smoke shaft systems, we discuss noise and attenuation requirements. 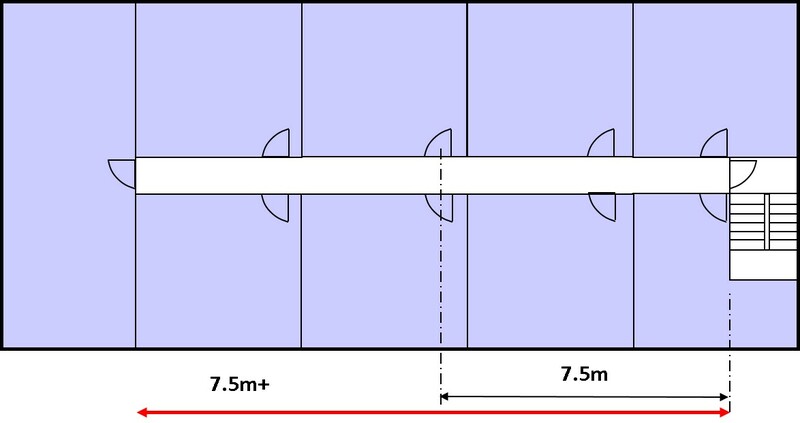 When considering noise, shafts can be split into two types, those with and those without day-to-day comfort ventilation provision. Key considerations for smoke shaft systems: 4. What type of shaft vent? In the fourth article in our series about designing smoke shaft systems, we discuss the choice of the vents between the lobbies and the shaft. Seems a simple choice, but there’s more to it than aesthetics, as you’ll see. In the third article in our series about designing smoke shaft systems, we look at the rooftop equipment. This bit can be short and sweet as all we need at roof level are 2 (or sometimes 3) roof ventilators – one at the head of the stair, one at the head of the shaft and, for residential buildings, sometimes one as an AOV to separately ventilate the top floor lobby to minimise the height above the roof of the top of the shaft. Key considerations for smoke shaft systems: 2. Natural or mechanical? In this article, the second in our series about designing smoke shaft systems, we will look at the choice of natural vs mechanical shafts. Smoke shafts in multi-storey buildings take up potentially valuable space, so keeping the shafts as small as possible is beneficial and has led to mechanical shafts becoming a popular choice. But are they always the best choice? We look at some of the issues. Over a series of articles we will analyse the most important considerations when designing smoke shaft systems. We will cover a variety of topics including noise, power, extended travel distances, natural vs mechanical shafts, smoke ventilation only and dual purpose systems – beginning with today’s article on the builder’s work shaft. 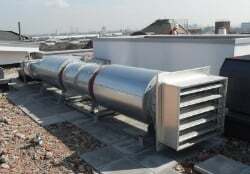 Smoke shafts in multi-storey buildings are invariably builder’s work as no-one wants to go to the unnecessary expense of installing a steel duct which will end up being enclosed by builder’s work anyway.